Don’t misunderstand the stakes in the South China Sea. Beijing is deliberately, emphatically and determinedly occupying rocks within the so-called nine-dash line as part of its unilateral assertion of sovereignty. It will not back down. Australia has, essentially, two choices: either accept what’s going down or choose war. It’s that stark, although there’s also a corollary. The more we huff and puff over this issue, the more we protest against China’s actions, the weaker we’ll eventually look. Why? Because nothing we can do will change the mainland’s stance. The only surprise is that people who should know much better think we can achieve anything through out ‘protests’. It’s time to get real. These waters are one of the last bits of terra nullius - unclaimed land - in the world. Of course, even that statement is not quite true because the sea (or bits of it) have been claimed by all of China, Taiwan, the Phillipines, Vietnam, Malaysia, Brunei and Indonesia. The problem is that, since the end of World War Two, these rival nations have never had the capacity to enforce their claims by creating territory. Until today. 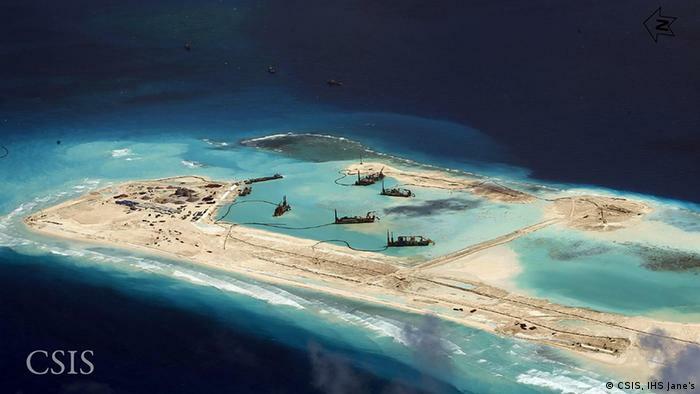 Now China is actually occupying the water it’s claimed by both building islands and establishing facilities, like oil wells, to use the supposed resources. Today Beijing doesn’t just have the economic might to turn submerged rocks into islands, but also the military power to shoulder aside the rival claimants. It’s capacity to turn a reef that’s only visible at low tide into an airbase ringed with missiles suggests Beijing is not in the mood for negotiating alternative outcomes. China also refuses to be bound by international tribunals, just like the United States. Superpowers are different that way. Both Malcolm Turnbull and China’s President Xi Jinping drew on the historian Thucydides to warn of the ever-present danger of accidentally stumbling into a war. They referred to the passage suggesting the dominant power (in Ancient Greece, Sparta, today the US) to accomodate the rising force (Athens, or China). But the ancient author wrote another passage that bears more relevance for Australia; one that both Turnbull and Julie Bishop might like to note. Halfway through the Peloponnesian War in 416 BC, Athens demanded tribute from the neutral island of Melos. The islanders wouldn’t pay. The Athenian’s didn’t bother to reason with the Melians, simply insisting that “the strong do what they will and the weak suffer what they must”. The islanders appealed to the laws of the gods but the Athenians were dismissive, insisting that might is right. After a siege the city was captured: adult men were executed; women and children sold into slavery. Sometimes there’s just no reasoning with a rising superpower. There’s concern that the HQ-9 surface-to-air missile that’s been deployed threatens civilian airlines. It might, although we don’t even know what variant of the device is on the islands. It might be the HQ-19 variant, a slightly different (but very advanced) warhead which instead of being designed to attack is intended to protect Chinese territory against intercontinental ballistic missiles in their terminal stages. The tenders are also, quite literally, just pulled up on the beach. What’s the long-term plan here? We just don’t know. Navigating in uncertain waters doesn’t make any sense. And this is the crucial element. It’s illogical to believe Australia should go to war to keep open the very sea lanes which take our goods to China. It’s a non-sequitur. More than a century ago, when the US was becoming a superpower, it had no difficulty discovering its own unilateral voice and telling other countries to keep out of the Caribbean. It had no problem invading Cuba, for example, and the Phillipines. It aggressively seized overseas territories from ageing colonial powers in order to become one itself. Beijing’s actions are, by comparison, almost timid and polite. The other point is that we can’t do anything about the South China Sea. The Navy calls what they’re doing when we sail or fly in this region a Freedom of Navigation exercise, using the abbreviation FON. A much better acronym might be FONE (pronounced ‘phoney’) because that’s exactly what we’re engaged in. It’s as if we were heading down the road and suddenly swerved in to drive through someone’s front yard. You may have proved you can, but so what? Why, exactly, is it so vital to Australia’s national interests that these waters are kept out of China’s hands when the neighbouring countries may be dissatisfied with the land grab but aren’t doing anything about it? They know the risks are too great. Don’t forget what we’re talking about here - war. Beijing’s not about to back down. The game’s up. Anyone who’s silly enough to fulminate about this issue is full of hot air. It’s a lost cause. Particularly when there’s a far more vital bit of empty land that we should be very concerned about. The whole reason the South China Sea’s become an issue is that it wasn’t ‘owned’ by anybody. The thing is there’s another bit of the globe that’s also regarded as terra nullius, Antarctica. What happens in that continent will be far more important for our future than anything that happens in the waters off China. We’ve already claimed a huge swathe of Antarctica and, although development is prohibited, we’re doing virtually nothing with this huge area. The Chinese antarctic presence, however, has grown quickly since 1981. It’s currently running three research stations on that continent, all in the area claimed by Australia. Two years ago Xi Jinping visited the Australian Antarctic Division’s HQ in Hobart. At that time he reassured scientists that Beijing had no intentions of mining either the frozen landmass or its waters. Let’s hope that’s still China’s attitude in 2048 when the treaty expires. I hope you're not suggesting we should trust China, Nicholas ? Their level of integrity can be closely aligned to the level of capitalist return which the Communists have been so quick to embrace. Antarctica is precious for many reasons and it is a long way from Beijing no matter which direction is travelled. Nic, According to the electoral roll Barnaby is still living with Natalie. Vikki's address is suppressed.